Just a few words on some of the books I've read over the last month or so - a wide range of genres, from highbrow to lowbrow, you must admit! I guess I've read about four or five Harlan Coben novels in my time, mainly on long and boring plane flights. This one, his latest, is only mildly entertaining, although I must admit that Coben is interesting in that he has a real gift for portraying the emptiness and ordinariness of modern American suburban life. His characters are real people in real family situations. He rarely goes underground, with criminals, murderers, serial killers, and other ugly types. This is middle class fiction, and sort of wholesome, and the focus is usually on teenagers and parents in stressful, but still ordinary situations. I guess Coben writes about what he knows. Lee Child's new Jack Reacher thriller 61 Hours is much, much better than his last one, Gone Tomorrow. Child actually takes time to explore Reacher as a character, his past, what makes him tick, etc. He comes out of this a fully developed and believable human being and therefore a hell of a lot more interesting. The plot is excellent too. Unputdownable, as all good thrillers need to be! 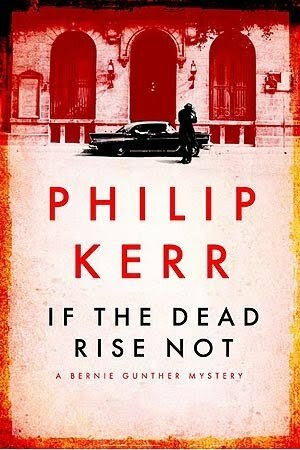 All the literati across the globe are suddenly into English crime writer Philip Kerr, so I had to read his latest And The Dead Rise Not, just to find out what all the fuss was about. Kerr's central character is ex-policeman Bernie Gunther, who plied his craft in Nazi Germany, specifically Berlin, in the 30's and 40's. This is Gunther's sixth outing. While an enjoyable read on many levels, particularly political, I was disappointed overall. Kerr just tries way too hard to get the slick, private-eye, Philip Marlow patter in there, and it's forced and irritating. It's look-at-me-aren't-I-stylish annoying. And the book is full of structural flaws in plotting and character. Nobel Prize winner, Turkish novelist, Orhan Pamuk released his latest novel The Museum of Innocence late last year, and I've sort of been meaning to get around to reading it, you know, but it's sooo long and looks so, like....serious. So when the ABC's First Tuesday Book Club selected it for discussion in May I thought OK..it's time. Now when you read a novel by a Nobel laureate you don't say 'Oh, I didn't like it...it didn't grab me..etc'. Literature at this level judges YOU, you don't judge it! (take note Marieke!). So I feel rather good about exclaiming to all and sundry that The Museum of Innocence is simply superb. It's boring in parts, the central character is a tad annoying, and there's an argument for saying it's 100 pages too long, but when you finish it and you feel that deep level of satisfaction that a good literary experience can bring, these things become trifles. The novel is set in the fabulously interesting and ancient city of Istanbul in the mid-70's, and it explores the intense and passionate love between a rich young man and an astonishingly beautiful, but poor, young girl. As it turns out her beauty becomes toxic and destructive, and ultimately tragic for both of them. This novel could not have been written in the West. It takes far too seriously some very traditional themes of virginity, fidelity, marriage and family. But that's precisely what makes it so fascinating and powerful. Highly recommended. The Norseman's Song is a new novel from Melbourne poet and former speechwriter Joel Deane. It is dark and unremitting in its very sure-footed exploration of human cruelty, violence and death. It has echoes of Joseph Conrad's Heart of Darkness - 'the horror, the horror' underpinning our fragile social cohesion, and how easily the bonds preventing our descent into hell can be destroyed. Deane's is a mature, rich and powerful vision, and his novel deserves to be widely read. Not for the faint hearted, but I loved it. Which nicely brings me to On Evil, a new literary-philosophical work from one of my favorite writers and thinkers, Terry Eagleton (I raved about his Reason, Faith and Revolution: Reflections on the God Debate, in May last year in this blog). Unfortunately On Evil is nowhere near as good, and I found myself frequently nodding off while reading it. Eagleton never clearly states his case, but chooses to let it emerge through his subtle engagement with a number of literary classics, philosophical treatises and historical events such as the holocaust. The blurb calls this 'a witty and accessible study'. I'd call it anything but! If you love Marcus Zusak's The Book Thief (and who doesn't?) you will also love the new English translation of German novelist Hans Fallada's Alone in Berlin. First published in 1947, this gut-wrenching novel is a masterpiece in its graphic portrayal of German society under the Nazi regime. Truly invigorating. Contemporary American writer David Shield's Reality Hunger proclaims itself as a manifesto for writers of non-fiction. It's a call to arms, an attempt to destroy the concept of fiction as a still relevant art form. The book comprises 618 relatively brief but strong and succinct statements, many of which are intriguing, suggestive, resonant and powerful. For example: number 405: 'Great art is clear thinking about mixed feelings'; number 529: 'We are adrift, alone in the cosmos, wreaking monstrous violence on one another out of frustration and pain'. Well into the book you start to realise, if you hadn't twigged at the start, that this entire work is a strung-together series of quotations from other writers. This is only acknowledged, reluctantly, and at the insistence of his publisher, at the end. Which proves Shields' major thesis that all art is a re-use and re-cycling of prior works, an exquisitely post-modern statement for our times. Interesting, but pretty uninteresting at the same time. I was not real sold at the end.